At 26, after a lover threatens to kill her, Cara runs away to Alaska. In the Last Frontier she lands in a love triangle with two alcoholics: Chance, a paraglider pilot obsessed with danger, and Sean, a martial artist obsessed with death. Nine years later, she runs again, to backpack around the world alone. Along the way, she discovers that love is not something to search for, but a place to come from. They Only Eat Their Husbands is a memoir of her yearlong trek, against a backdrop of reflections on her life and loves in Alaska. If you'd like a book signed for someone other than yourself, please write the name(s) in the PayPal pop-up window that says "Special Instructions to the Seller." "I've read many memoirs, but it's rare when an author really opens up and divulges her innermost insecurities. Cara Lopez Lee never leaves a question unanswered and brings the reader right into her roller coaster world of abandonment, commitment phobic/alcoholic boyfriends, and her colorful surroundings...No matter your background, you'll be able to take something from this book, whether it's how to stand up for yourself, how to steer clear of an unhealthy relationship, how to trust your instincts, or how to live according to your rules." "I loved Cara Lopez Lee's memoir. The characters are as well drawn as those in novels, the relationship dynamics fascinating, and the journey of self-discovery very satisfying. I don't know how she came up with the book's structure—very risky—but it definitely works. The voice in the memoir is charming and honest, without being cloying or precious. It's a voice you definitely want to spend time with." "A delightfully engaging read. Lee reminds us that in travel as in life, the inward journey is as messy, important and rewarding as the outward one." "With an open heart, Cara Lopez Lee relates her round-the-world journey to self-discovery with the unabashed, dazzling honesty of a good friend telling you her innermost secrets over a cup of coffee. The backdrop of intriguing cultures and landscapes further enriches Lee's bold memoir, They Only Eat Their Husbands." "Lee's compelling personal journey is told with a modesty that downplays the many achievements that she has accomplished and the sometimes painful lesson she has learned throughout her life. The pages turn easily with vivid descriptions not only of the places she travels through but of the lovers, friends and people she travels with." 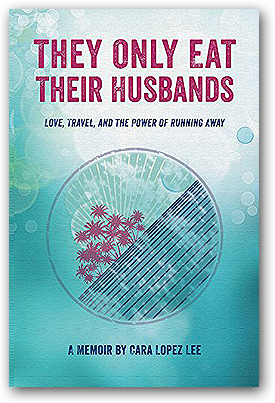 "They Only Eat Their Husbands is a witty and moving story that truly captures the sense of wonder, self-discovery and adventure that unfolds when one throws caution to the wind and ventures out into the world alone. This is what travel is really all about... experiencing real life through unfiltered eyes, embracing the unknown, challenging yourself and never losing your sense of humor in the process. A great book that will make you think long after you put it down." "Lee writes candidly about her adventurousand sometimes tumultuousjourney through life. Her vivid prose draws you into that journey. Her passion makes you want to stay for the ride." "Lee gets it right about life and love in the Last Frontier in They Only Eat Their Husbands. Her adventures on the road had me laughing out loud with a heart-tugging message we can all relate to." "Lee takes you on a fun, fabulous adventure... perfect for any woman who wishes she could escape 'life' to travel the world." "Lee's ill-advised romances with a cast of Alaskan rogues had me alternately laughing and wanting to shout, 'No, don't do it!' Meanwhile, her descriptions of the unusual people and exotic locations she encountered on her travels, made me eager to experience them myself... until I remembered Asian rats and European robbers are not my thing."